Current conditions on Grand Avenue. Grand Avenue is one of the most popular roads for cyclists in Oakland — and by some measures is also one of the most dangerous. That's according to the city's own research, which has found that parts of Grand Avenue near downtown and Lake Merritt attract very high volumes of cyclists, but have also had a high number of collisions over the years. Part of the problem, according to bike advocates, is that the bike lane on Grand Avenue is inconsistent — cyclists riding east from downtown toward the Grand Lake district are forced to leave the bike lane and merge into car traffic near the Grand Lake Theater. 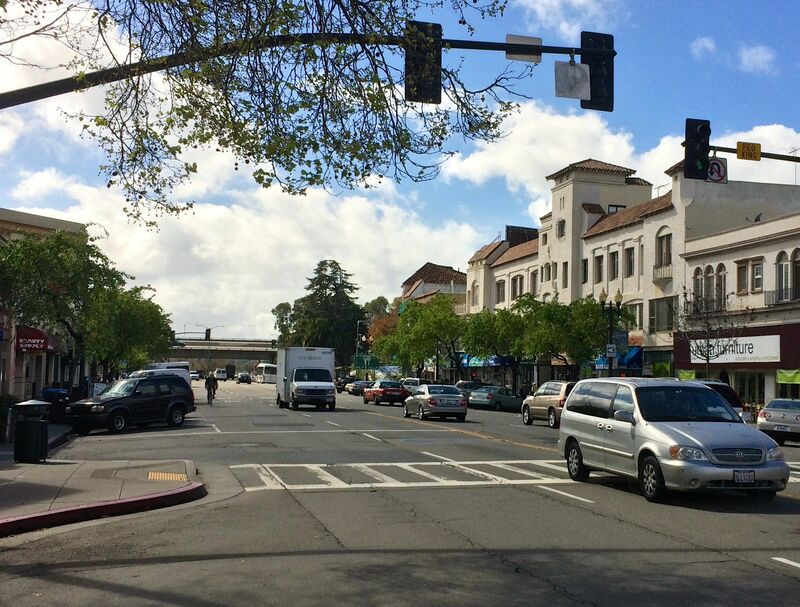 Now, the city is proposing adding new bike lanes on Grand Avenue between Elwood Avenue and Jean Street in the Grand Lake district — a reconfiguration of the road that could make it a lot more comfortable for cyclists to travel between the Adams Point neighborhood and Piedmont. While bike advocates say this would be an important step in making the busy thoroughfare significantly more bike-friendly, some worry that the plan does not go far enough in building a truly connected bike path for cyclists in the area. The proposal — which the Oakland City Council's Public Works Committee reviewed today and unanimously approved — calls for the removal of a car travel lane in either direction to make room for separate, five-foot bike lanes. Currently, the Grand Lake section of Grand Avenue has two car lanes in either direction and bike markings called "sharrows" on the road, which indicate that cars and cyclists should share the street. As I noted in "Shifting Gears," a March Express cover story on the city's bicycle infrastructure, advocates were disappointed when the city recently repaved this northern section of Grand Avenue as part of its general street maintenance — but failed to add bike lanes in the process (instead only painting sharrows on the road). That was despite the fact that the city's surveys had found that during rush hour, Grand Avenue attracts incredibly high rates of cyclists; for example, in a two-hour period, the city counted as many as 460 cyclists on Grand and Bay Place (near Whole Foods). And a city analysis of crash data from 2007 to 2011 (full report here) found that Grand north of the lake and in Uptown was one of the city's most dangerous corridors for both bicyclists and pedestrians. Beyond making the road safer for cyclists, this redesign would also make the street safer for pedestrians, according to city officials and advocates. That's because, a reduction in travel lanes would likely reduce the speed of cars, which have consistently driven above the speed limit on Grand, according to the city's surveys. The addition of bike lanes would also make it easier for vehicles to see pedestrians crossing, according to the city. The city predicts the redesign would have a very minimal impact on cars passing through, while greatly reducing the risk of collisions affecting pedestrians and cyclists. 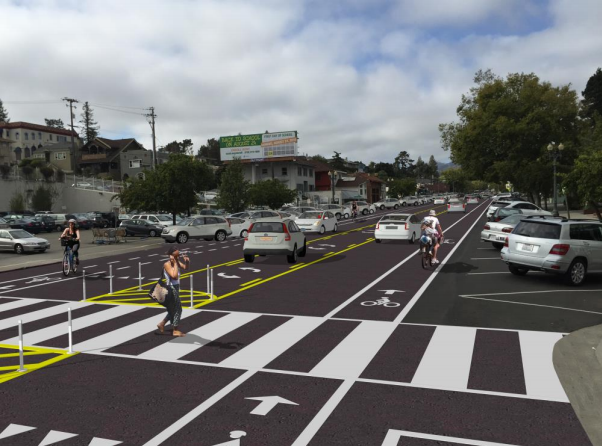 The City of Piedmont also adopted an identical bike lane design on its section of Grand Avenue last year, which means cyclists would have a connected bikeway from Oakland to Piedmont. Advocates with Walk Oakland Bike Oakland, who have closely followed this project, have argued that there are two major ways this redesign does not go far enough in terms of bike and pedestrian safety. For starters, the advocates have asked that the city extend the bike lane south to Lake Park Avenue to fully connect to the existing bike lanes on Grand by Lake Merritt. Otherwise, cyclists will still have to weave in and out of the bike lane at the busy and complicated intersection by the Grand Lake Theater. Without a fully connected bike lane, cyclists who are less comfortable on the road may be discouraged from riding to the neighborhood. Although that extension south would effectively only expand the bike infrastructure by one block, the city said in its latest report that it does not have funding to increase the project boundaries and that the city would need to do more traffic analysis and outreach. The city could consider an extension of the bike lane if this first phase is successful, the report said. Walk Oakland Bike Oakland has also requested that the city adopt so-called "back-in/head-out" angled parking spaces, which means cars back into the spaces, instead of driving into them and facing the sidewalk. This gives drivers significantly more visibility when exiting, making it much safer for them to enter traffic and avoid potential collisions with cyclists or other cars. But the city's report argued that this would be inconsistent with other segments of Grand Avenue and that drivers may have trouble backing into spaces. The city also said that back-in angled parking sometimes requires larger spaces, which means the city could potentially have to reduce the number of parking spaces on the street if it made this switch. If the full council approves the proposal, the city would add the bike lanes to Grand later this fall or in spring 2016.